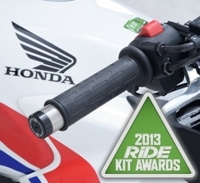 Andrew ****: "Hi Liam, I really like the R&G heated grips. Much wider range of temperature settings than the original BMW ones on my other bike. Sometimes it's nice just to have them on the lowest setting and on a cold day it's great to be able to really crank up the temperature.